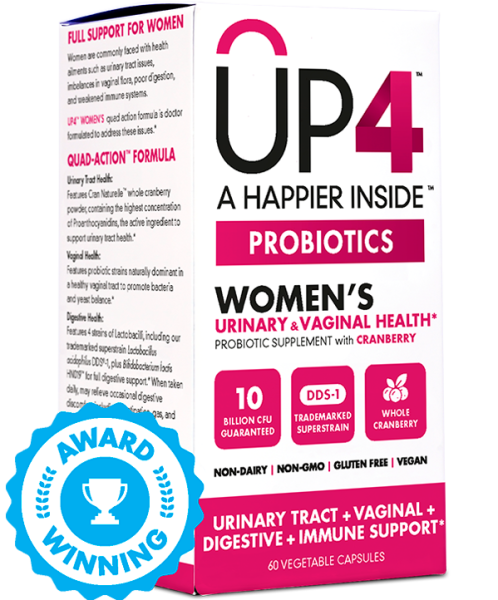 UP4 is the newer name for the UAS Laboratories brand of probiotics. 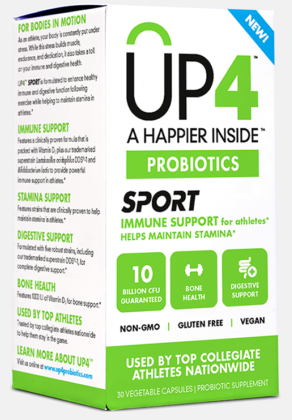 Each UP4 supplement contains the trademarked strain Lactobacillus acidophilus DDS-1. They also contain specific trademarked UAS lab strains instead of generic microbes in past formulations. For more information about the history and studies using Lactobacillus acidophilus DDS-1 strain, click here. UAS Laboratories is a company founded in 1979 by Dr. S.K. Dash with a dedicated probiotic facility in Wausau, Wisconsin. They state that they use only scientifically validated strains that have the innate toughness to withstand distribution and storage at less than optimum temperatures and maintain viability for over 24 months. According to the UAS Laboratories website, all the strains in these products are human-sourced. All of their products are bottled in recycled glass bottles for maximum protection from moisture and air and are guaranteed for label potency at the time of expiration. Products should be refrigerated once opened. They all are marketed for “A Happier Inside” and for support of digestive and immune health at a minimum. 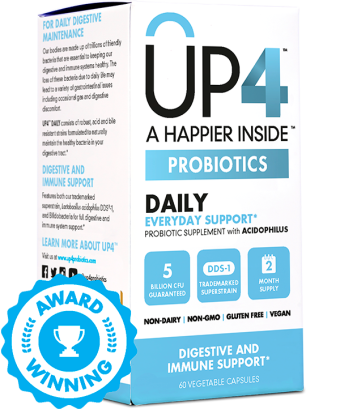 There are 10 different UP4 probiotic supplement formulations as of February, 2018. Please note that nearly all of the products have been reformulated since 2016, not just with different added ingredients but also with different microbes. Some have changed names and two (Acidophilus and Green) have been discontinued. Most of the products have changed from what they were earlier in 2016 without labels changing. Many of them contain undisclosed amounts of FOS (fructooligosaccharides) which could pose digestive problems for some people depending on their sensitivity. The cubes contain milk. All strains are said to be naturally acid and bile resistant. Please always check ingredients prior to taking any supplement! contains 5 billion CFU total of a 50%/50% blend of Lactobacillus acidophilus DDS-1 and Bifidobacterium lactis UABla-12. It is marketed for digestive and immune support. The other ingredients are vegetable cellulose, fructooligosaccharide (FOS) in an undisclosed amount and silica. Dosage is 1 capsule per day before or during meals. It is non-dairy, non-GMO, gluten free, soy free, vegan, shelf stable, contains no artificial preservatives and is naturally acid and bile resistant. 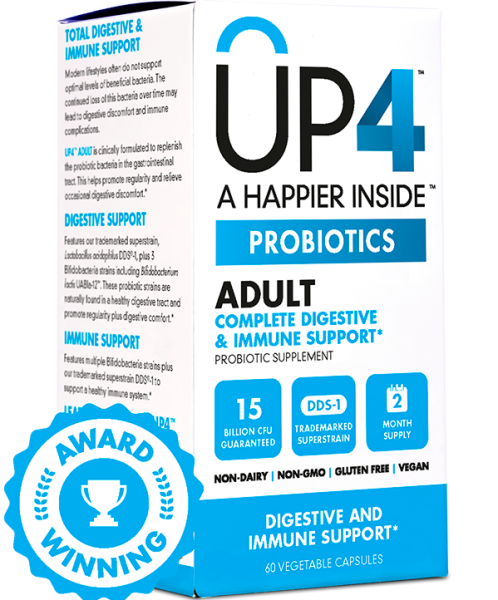 contains 15 billion CFU total of a proprietary blend of 50% Lactobacillus acidophilus DDS-1 (7.5 billion CFU)and 50% of the bifidos Bifidobacterium lactis UABla-12, Bifidobacterium longum UABl-14 and Bifidobacterium bifidum UABb-10. The other ingredients are vegetable cellulose, fructooligosaccharide (FOS) in an undisclosed amount, and silica. 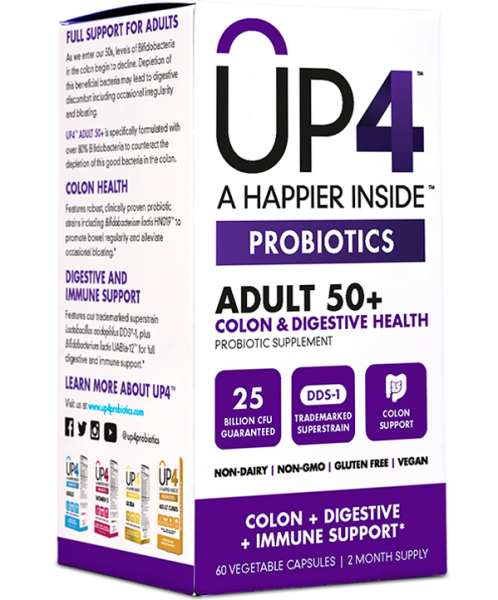 contains 25 billion CFU total of a proprietary blend of 80% Bifidobacterium with Lactobacillus acidophilus DDS-1, Bifidobacterium lactis HN019, Bifidobacterium lactis UABla-12, Bifidobacterium longum UABl-14 and Bifidobacterium bifidum UABb-10 . It is marketed for colon health, digestive health and immune support. It is known that Bifidobacterium levels decrease with age, which may make the colon's functioning less ideal. Lactobacillus acidophilus DDS-1, Lactobacillus plantarum UALp-05, Bifidobacterium lactis UABla-12, Lactobacillus paracasei UALpc-04, Lactobacillus casei UALc-03, Bifidobacterium lactis HN019, Lactobacillus rhamnosus UALrh-18, Bifidobacterium longum UABl-14, Bifidobacterium bifidum UABb-10 and Bifidobacterium breve UABbr-11. The other ingredients are vegetable cellulose, fructooligosaccharide (FOS) in an undisclosed amount, vegetable magnesium stearate and silica. contains 500 mg of organic cranberry powder with 10 billion CFU total of a proprietary blend of Lactobacillus acidophilus DDS-1, Lactobacillus gasseri UALg-05, Lactobacillus plantarum UALp-05, Lactobacilllus rhamnosus UALrh-18, and Bifidobacterium lactis HN019 in 2 capsules. It is marketed for urinary tract health, vaginal health, digestive health and immune health. Cranberry powder is known to benefit urinary health. An in vitro study in 2016 investigated whether proanthocyanidins (c-PAC) derived from cranberries alone or with probiotics could inhibit the ability of pathogenic E. coli to invade cells. Some of the authors had financial interests in the project. The results showed that c-PAC concentrations greater than 36 µg c-PAC/mL significantly reduced E. coli invasion, and probiotics did not interfere with its effectiveness. The probiotic blend also significantly reduced invasion using a different mechanism than the cranberry powder. When combined, the two products had better anti-invasion activity than the c-PAC alone. Thus, there is a potential benefit of combining c-PAC components from cranberry foods with probiotics. The other ingredients are rice maltodextrin, vegetable cellulose, vegetable magnesium stearate and silica. Dosage is 2 capsules per day before or during meals. 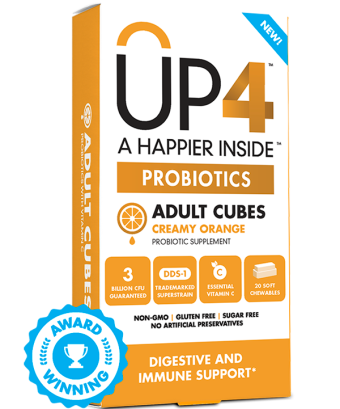 are creamy, orange-flavored, sugar-free chewables containing 20 mg of vitamin C with a 3 billion CFU total proprietary blend of Lactobacillus acidophilus DDS-1 and Bifidobacterium lactis UABla-12. Each serving has 10 calories, 1 g of saturated fat and 2 g of carbohydrates. The other ingredients are maltitol, palm oil, skim milk powder (allergy alert! ), fructooligosaccharides (FOS) in an undisclosed amount, natural vanilla from vanilla bean, sunflower lecithin, tocopherol ascorbyl palmitate (vitamin E), natural orange flavor from orange oil and paprika extract. Dosage is 1 chewable per day. It is non-GMO, gluten free, soy free, has no artificial preservatives, contains vitamin C, is shelf-stable, and contains naturally bile and acid resistant strains. It is marketed for heart health, digestive health, and immune support. 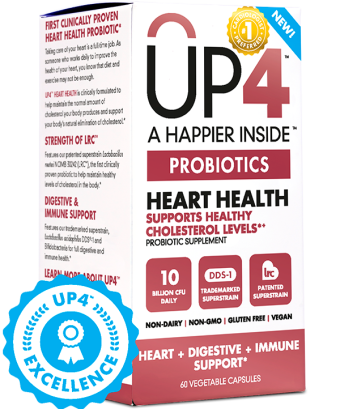 It's heart health claim relates to the presence of Lactobacillus reuteri NCIMB 30242 (LRC™) for its ability to lower cholesterol. It is a proprietary blend of 5 billion CFU per capsule of Lactobacillus reuteri NCIMB 30242, Lactobacillus acidophilus DDS-1 and Bifidobacterium lactis UABla-12. Dosage is 1 capsule twice daily. Other ingredients are vegetable cellulose, gellan gum and silica. It is a proprietary blend of 10 billion CFU per capsule of Lactobacillus acidophilus DDS-1, Lactobacillus acidophilus NCFM, Bifidobacterium lactis Bl-04, Bifidobacterium lactis Bi-07 and Lactobacillus paracasei Lpc-37 with 1000 IU vitamin D3. 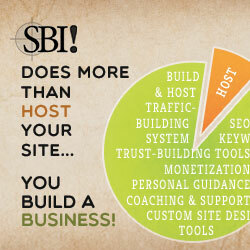 It is marketed to help with immune support, stamina, digestive health, and bone health. Dosage is 1 capsule daily with meals. Other ingredients are vegetable cellulose, vegetable magnesium stearate and silica. are vanilla-flavored chewables containing 1 billion CFU of Lactobacillus acidophilus DDS-1 and Bifidobacterium lactis UABla-12 with 800 IU of vitamin D3. 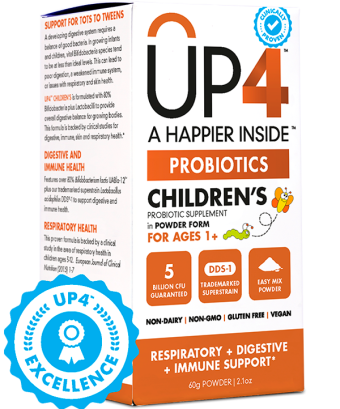 It is marketed for digestive support for ages 3 and up. The other ingredients are maltitol, palm oil, skim milk powder (allergy alert! ), fructooligosaccharides (FOS) in an undisclosed amount, sunflower lecithin, tocopherol ascorbyl palmitate (vitamin E) and natural vanilla flavor from vanilla bean. Dosage is 1 chewable for children ages 3 and up who can chew per day before a meal. It is non-GMO, gluten free, sugar free, shelf-stable, contains no artificial preservatives and is naturally acid and bile resistant. It contains vitamin D3. is a powder formula and one-quarter teaspoon contains 5 billion CFU total of a blend of 80% Bifidobacterium lactis UABla-12 and 20% Lactobacillus acidophilus DDS-1. 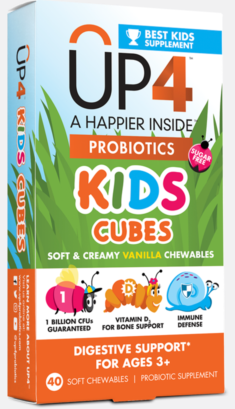 It is marketed for children ages 1 and up for digestive, respiratory, skin and immune support. The other ingredients are potato maltodextrin, fructooligosaccharide (FOS) and silica. Dosage is ¼ teaspoon mixed with cool water or food for children ages 0-3 and up to three ¼ teaspoons per day for ages 3 and up. It is non-dairy, non-GMO, gluten free, soy free, preservative free, vegan and shelf-stable. This product was used in studies. For more information on them, see this page. 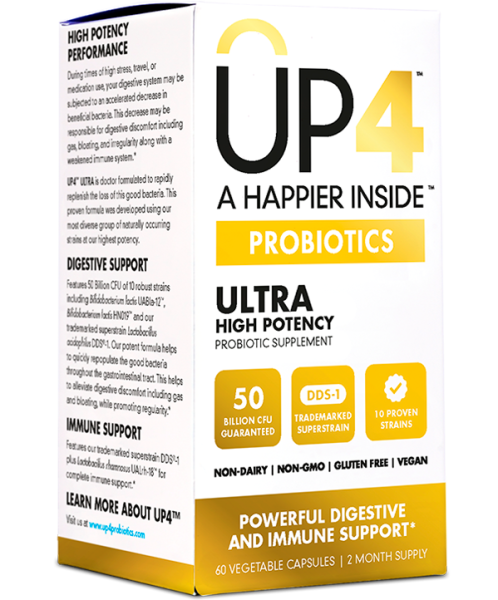 Are the UP4 Products Right for YOU? Choosing a probiotic supplement can be difficult, so if you need help doing so, nutritional consultations can be beneficial. Supplements should always complement, not replace, real food and healthy lifestyle habits. Return to page about other probiotic supplements.